He has said the government forced him to be "scapegoat" for the "national interest"
When asked whether Musharraf would admit this, Khan said: "It is his business"
(CNN) -- The Pakistani scientist who admitted leaking nuclear secrets to North Korea, Iran and Libya has again recanted his confession. Abdul Qadeer Khan has been under house arrest in Pakistan since his television confession in 2004. 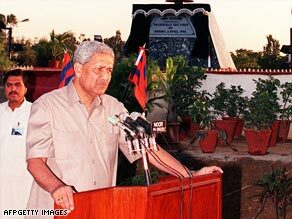 Abdul Qadeer Khan is widely regarded as a hero in Pakistan for his part in helping the country to develop nuclear weapons. In an interview with CNN Wednesday, Khan denied being responsible for the proliferation of nuclear secrets. "I did not indulge in any proliferation but I am proud of helping my country to stand on its feet and to be safe. Because we had so many wars with India -- we lost half of our country," he said. In 2004, Khan was placed under house arrest in Pakistan following his admission on Pakistan television that he had been involved in a clandestine international network selling nuclear weapons technology from Pakistan to a host of nations including Iran and North Korea. Pakistan has so far refused to allow the International Atomic Energy Agency and the U.S. access to Khan to quiz him on the extent of the nuclear secrets he sold. "Even if they had asked me I wouldn't have answered," he said. In May 2008, Khan denied his involvement with the spread of nuclear arms outside Pakistan. He explained in an interview with ABC News that the Pakistani government and President Pervez Musharraf forced him to be a "scapegoat" for the "national interest." He also denies ever traveling to Iran or Libya and said that North Korea's nuclear program was well advanced before his visit. When asked whether Musharraf would admit this, Khan told CNN: "It is his business. Whatever he has been telling people in the country. Whatever he says is up to them. But I can tell you that the man on the street is more knowledgeable than the man on the street in the United States." In a further twist, the normally placid Switzerland announced on May 23 that it had secretly destroyed highly technical blueprints for producing nuclear weapons. The information was seized from the home of Urs Tinner, a 43-year-old Swiss engineer who has been in custody for almost four years as a key suspect in the nuclear smuggling ring allegedly run by Khan. At a news conference, Swiss President Pascal Couchepin said the documents had been shredded to prevent them from falling into terrorists' hands. "The information contained in these papers presented a considerable risk to the security of Switzerland and the international community as a whole," he said.